Does AR/VR need innovation or investment to become mainstream? With the recent release of the movie, Ready Player One, all eyes are on augmented and virtual reality (AR/VR) once again. Over the last few decades, these technologies have garnered attention but haven’t been able to progress past early adoption, leaving them in a constant state of anticipation. Consumers are already getting a fresh flavor of these technologies through smartphone apps like Pokémon Go and headsets to experience 360-degree virtual reality videos. And now, as industry giants like Amazon and Facebook make substantial investments and new start-ups emerge daily, it seems that AR/VR may finally be ready for the spotlight. Even with this hype and investment, the AR/VR market is still far from mainstream adoption and unsettled among those driving innovation. Devices haven’t found a standard form factor and the content type is yet to become mainstream. But advancements are being made at such a rapid rate that the tipping point can’t be too far into the future. Jabil recently sponsored an Augmented and Virtual Reality Trends Survey of more than 200 AR/VR business and technology stakeholders that design, market and/or manufacture products. With representation from industries such as consumer electronics, retail, entertainment and healthcare, their perspectives on AR/VR progress provided a pulse on these technologies. As with integrating most new technology, AR/VR will require prodigious planning and investment before product companies make the leap into this realm. Where do you begin? What problems do you try to solve? Where do you focus your investments? Given the volatility of this emerging market, only 29 percent of survey participants say they have a plan or framework at some stage of development, including just 11 percent that are executing on that plan today. In their work to chart the uncharted, stakeholders also have little consensus on the “killer app” for AR/VR. Sixty percent of participants say that consumer use will push AR/VR mainstream—perhaps focusing on developments in gaming and entertainment or use-cases through smartphones, which are widely adopted by consumers worldwide. In fact, 69 percent of respondents believe smartphones will be the most popular devices to experience AR/VR over the next few years. Interestingly, the perspectives are flipped depending on a company’s level of experience with AR/VR technology. Stakeholders at companies that have a pilot or plan in place believe business or enterprise use will take hold before consumer adoption. Augmented and virtual reality have tremendous market opportunity, but there are still big business hurdles to clear before these technologies go mainstream. 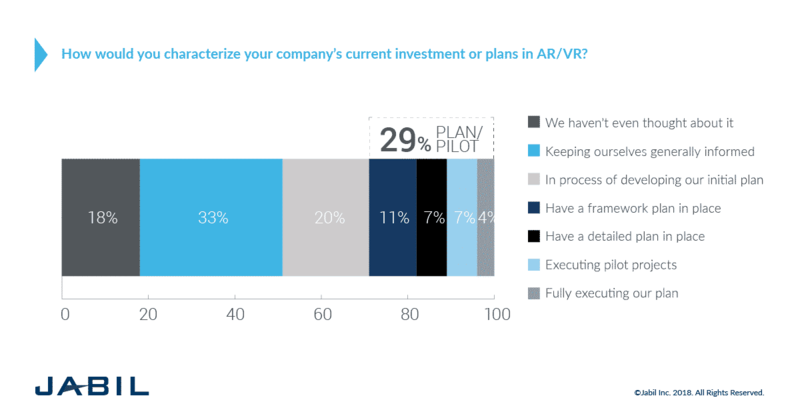 Companies must determine their next step to strategically capture the benefits of AR/VR. 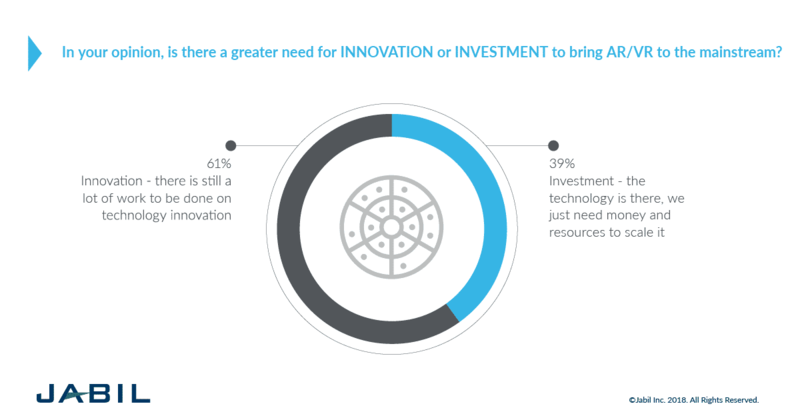 Sixty one percent of business and technology stakeholders say more work is needed in technology innovation, while the remainder believe the technology is there and we just need the necessary investments and resources to scale it. 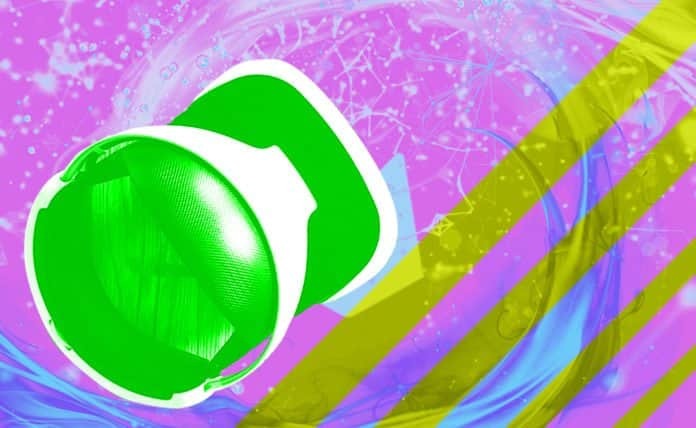 Digging further into where the innovation and investment is needed, 74 percent of participants say that innovation must be focused on the technology to create content, while 64 percent say investments need to be focused on devices to experience the content. Almost all of the stakeholders report facing technology and content challenges with augmented and virtual reality. The leading three technology challenges included the price of manufacturing, technology limitations with AR/VR-specific devices and consumer technology limitations. Cost seems to be prohibitive in content creation as well, serving as an obstacle to mainstream adoption. Participants also listed limited hardware and inadequate software for content creation, serving as opportunities for vendors to enhance (or create) offerings that will meet market expectations. As companies develop their AR/VR plans and overcome their challenges, they will rely on their vendors. Eighty-nine percent of respondents say their vendors play a role in helping them meet AR/VR objectives. Two ways vendors can help companies? While we understand where the future may be going, we also need to be realistic about the maturity of the ecosystems around AR/VR, which are not yet fully formed and may require unique adaptations. Nonetheless, 69 percent of respondents expect AR/VR to become mainstream in the next five years. Undoubtedly the future will see the AR/VR market transition to something beyond novelty and the gaming community, as true improvers of the consumer experience. Early adapters will no doubt be rewarded, having overcome all the compatibility and technical issues they’ll face in these infancy years, so that their understanding when the technologies mature will be uncontested. Written by Michelle Saro, Director of Marketing, Jabil Green Point.